90 different size combinations in mild steel or stainless steel. Modular cabinet design with option of front and rear doors or front door and removable rear panel. Front door is also available with window panel. Cabinets can also be joined together. CE-1000 mild/stainless enclosures are supplied with protection to IP55 as standard. CE-1000 enclosures are available in 51 different sizes from – 1600 mm high x 400 mm wide x 400 mm deep to 2000 mm high x 1600 mm wide x 800 mm deep. Finished in powder coated grey (RAL 7035) as standard with other colour options available. CE-1000 series has been designed as a modular cabinet with the option of front and rear doors or front door and removable rear panel. 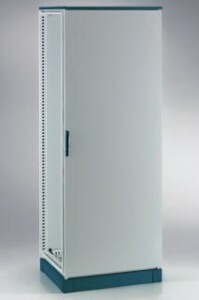 CE-1000 front doors are also available with window panel. CE-1000 cabinets can also be joined together with an optional joining kit. Modular 100 mm or 200 mm high floor standing plinths allow the cabinets to free standing or anchored with a suitable fixing kit. Lifting eye bolts can be mounted to each roof corner, allowing positioning during installation without damaging the cabinet. An inner door available as an optional extra. CE-1000 cabinets supports various 19″ rack units and configurations including mounting brackets, fixed frame and swing frames (see 19″ rack web page for more information). Painted RAL 7035 (grey) as standard, with special paint colours available on request, or 304 or 316 stainless steel.